The Limendo House of Strategy combines all all important business strategy theories of the past few years into one practical guideline. Basically, the establishment of a business strategy should be a simple task and also also a regularly performed process in each company. Just like you decide on your new year’s resolutions at the end of each year for the upcoming one, you should think about your strategy in regular periodic intervals. . You will never be able to work more and earn more, than you will be able to make in this short amount of time with just a few essential decisions and evaluations. The strategy is the foundation of your future success and your resulting profits. How do you establish a business strategy? What basic theories of business strategy are there? As we already discussed, the business strategy should be re-evaluated continuously and re-adjusted accordingly. The vision of your companyshould remain constant and lead you on your way. You will constantly monitor your . 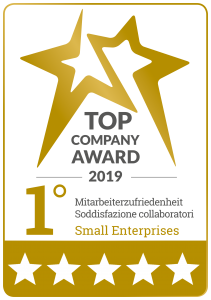 The strategic context is comprised of the business environment (such as your industry and the developments within this sector) as well as your own company and the available company resources. Based on this analysis, you will be able to analyse your companies’ strengths and weaknesses and with that evaluate where you have the advantage and also the disadvantage compared to your competitors. With these analysis, strategic options are being defined. Here, opportunities as well as risks should be established for every individual option. At some point, you will decide on one or multiple options and implement these. Bear in mind that these strategies, which you would like to implement, won’t always be implemented the way you have planned it. The implementation competence is therefore extremely important and one of the essential competences at Limendo Business Consulting. By regularly measuring the results of the business strategy, you can be sure where you stand and potentially implement correctional measures. The The results of the implementation are also an additional input for new strategic options and/or a re-evaluation of past strategic options as well as constant input for your vision. Hence, it comes full circle. It is very important that youyou incorporate these simple stepsinto your company On a ragular basis to ensure your business staying on course. By using the correct systems to measure your success, you will remain successful all the way. Before you enter the Limendo House of Strategy, we would like to quickly introduce you to two of the most important theoretical concepts of the strategy work. In the classic strategy work, we distinguish between two essential strands of competition theories. Both theories explain, how business success is created. The Market-based view argues that the market, the industry structure, is the driving factor for the essential competition characteristics. However, the resource-based view will look at the business characteristics and how they influence its success. determine the company’s own Positioning to achieve competitive advantages. All of these five sectors combined establish the intensity of the industry competition and profitability. The cost leadership requires that you become the low-cost manufacturer of the industry. The sources of such a cost leadership are plentiful and different from sector to sector. For example, you can have great access to raw materials or you have access to already written off machinery. As cost leader you must cover the basic requirements of your clients and forego any extra bells and whistles. However, the cost leadership is only successful for one business within an industry. There can only be one cost leader. In the differentiation strategy you will be significantly different from your competitors with regards to the for the client important dimension. There are limitless possibilities to be different. A differentiating strategy will always be successful, as long as the additional costs of the differentiation do not exceed the possible price-premium of the differentiation. In other words: You will be successful with it, if your clients are happy to pay a higher price for your overall package and if this higher price covers your higher costs. The focus strategies are based on previously presented main strategies and focus on one specific client segment and/or industry segment. Over the last few years, the resource-based view has become one of the leading theories. Compared to the market-based view, the resource-based view focusses on the internal production factors and competences. The company is being looked at as a bundle of resources, competences and knowledge, which guarantee the company’s success. In order to achieve a competition advantage, these factors have to be especially valuableby, for example, enabling access to a certain market or significantly contributing to the end product. For example, a hotel property in a certain area can be very valuable, because there they distinguish themselves from their competition. Additionally, these ,which means that they are rare and not every competitor has access to these resources. Therefore, if said property has boundaries and there is no way that it could be expanded, then this resource is rare. You can only achieve a competition advantage long-term, if you can protect these resources from being copied and from substitutes being made. Your essential resources must not be easily imitated.If after a period of time an expansion of the property zoning is applied, and your competitors can buy more property, your advantage will be significantly diminished. After all, you will still have to organize your resources in such a way that you are able to use them. Where to you want to do business? Where do you not want to do business? How do you want to survive your competition? What makes your products and services different from other businesses? How do you want to achieve those goals? The House of Strategy offers a clear answer to all of these fundamental questions. In general, we begin our analysis in the foundation of our House of Strategy, which is similar to the architecture of a real house. Meaning, if you are planning on building a strong house, you first must put down a strong foundation for it. Once that’s done, we will work our way from the top of the House of Strategy down. This will enable us to answer all questions regarding the business strategy clearly. Please be advised that the House of Strategy describes the business strategy for on specific strategic option. 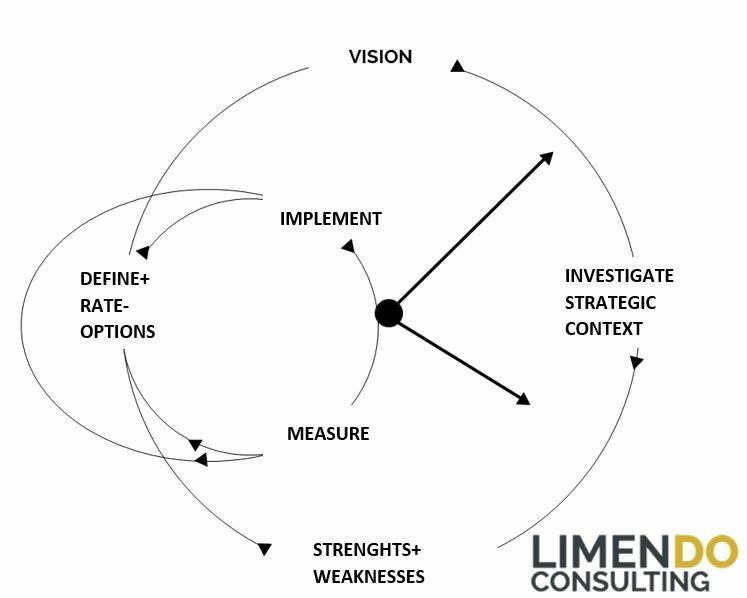 Only the value system as well as the vision, mission and the strategic areas are to be understood comprehensively. All other building blocks of the House of Strategy have to be worked out for each strategic option. Just imagine a huge building site. The vision and the mission would be the different building zones within the building plan that shows where to build on top of the foundation. However, every single house consists of its own building blocks and components. The foundation of the house is defined by the value system of the company or the company owner. Based on this value system is the entire rest of the business strategy. Here, it is important to understand that a value system can only influence your business’ success, if it is accurately implemented and lived by. Truly lived values will always cost money. However, also not-lived values do cost money. Please don’t ever forget that. To give you gutes a good example: Southwest Airlines. They made a big fuss about never letting any employees go, which showed that they value their employees. Even during the credit crunch in 2008 and thereafter they stuck to their guns and kept following this promise, which subsequently led to some negative quarter end accounts. However, this is counterbalanced by the pure loyalty of the company’s employees. Give and take. 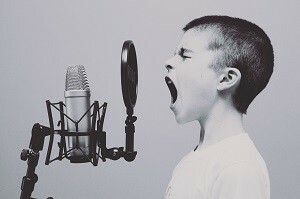 Exactly, how management expert Patrick Lencioni brings it to the point: “If you’re not willing to accept the pain real values incur, don’t bother going to the trouble of formulating a values statement.” Correctly implemented, a value system can be extremely powerful, which is why it is the base building block of a business strategy. Absolutely essential for the direction of the company is the business vision. The business vision describes what your company wants to achieve. Here, the vision always points towards the future and it is formulated in such a way that it establishes a clear goal for you, your company and your employees. The vision contains your dream for your business and it creates a base line for your workers and your clients as well as other stakeholders. themission essentially describes how you want to implement your business vision. It’s basically the written version of your vision. Whilst your vision could be an image, the mission is very specific and provides a clear guideline for the implementation of the business strategy for you and your employees. Apart from the vision and mission, in this phase we will also define the strategic areas for your business. These establish, where your company will be active and what kind of business you will definitely not have. This will provide very clear guidelines for your workers and employees. The strategic areas can be defined in accordance with various factors. There may be businesses, which cannot be in agreement with their value system or their vision and therefore you would have to exclude these. There may also be businesses, which show a high-risk profile and therefore you would have to exclude these. 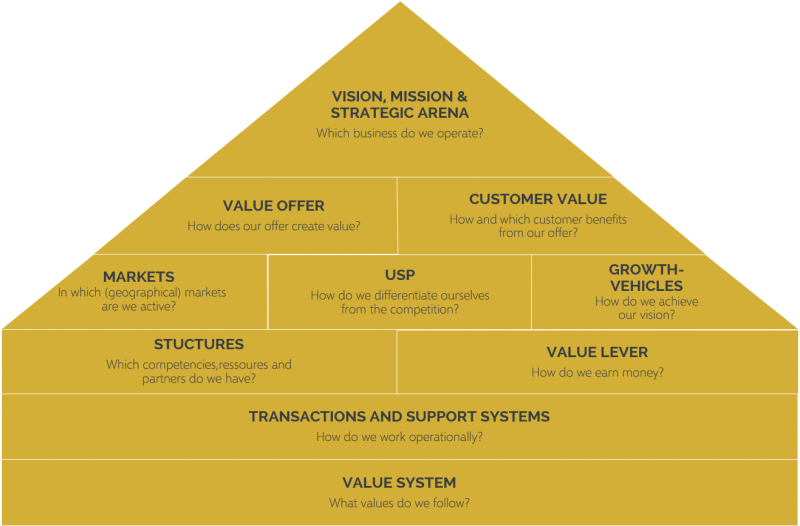 The value proposition describes in detail, what you offer your clients. What your service is or your product, what type of client problems they solve specifically, and how your clients can specifically use them/it. The client value describes how you help your clients. How does your client profit from your services or products? In this area of the Limendo House of Strategy, we determine what kind of markets you will manage, how you distinguish yourself from your competition and how you will grow. With regards to the markets, we focus on the classic market research. It will isolate the relevant markets, so you get a better understanding for them. It will analyse how large these markets actually are and with what type of growth rate these markets develop. With regards to the USP – Unique Selling Position, it is important to understand what your markets do in how much you distinguish yourself from your competitors. . In the end it is you, who decides, how you want to reach your vision. Will you grow organically? Would you like to buy out smaller competitors? Do you want to cooperate? The business structures are basically part of your business strategy. The structures determine, which competences, resources and partnersare available to you. The resources and their importance within the theoretical business strategy we have already discussed. Basically, it is important to understand, how exactly you want to implement all of the previously described dimensions. The resources will provide the base for your value proposition and what you want to offer your clients with your products and/or services. Partners also have significant leverage. Yet again, it is important to understand, if the followed business models depend on a specific cooperation or integration of external partners. The value leverage describes how you will earn money with your business strategy. This is not about creating a business plan, but instead to identify the levers of your company’s success. From business model to business model these can vary significantly. For example, if you strive the cost leadership within a certain area, one of the value levers would be the produced and sold amounts of product. If you want to follow a differentiating strategy, one value lever would be the popularity of your brand. Often neglected, this area is a deciding factor in your company’s success. With the wrong kinds of systems, you won’t be able to stay in the market long-term. One well-known growth boundary are the transaction and ERP systems of businesses. Often, they were created in the beginning, when the company started, but they were never adapted to the company’s subsequent growth. This cause self-made growth barriers within the company, which completely jeopardize the entire business strategy. However, often these problems remain unnoticed and other elements of the strategy are being blamed: The market wasn’t as strong as originally thought or the sales department failed. 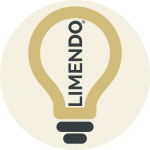 We here at Limendo know that this is mostly not the case and we focus especially on your understanding of your transactions as well as your operative systems. We know that the problems often start right there, in those internal systems.